With the click of a button, protect your enterprise Office 365, Box, G Suite, or any other SaaS application with cloud-based versions of security technology from best-of-breed vendors like Check Point, Symantec, and McAfee. You don't need to research and vet any security tools. The Avanan team seeks out innovative security technology from the industry's top vendors, as well as small, innovative startups that offer next-generation tools to prevent tomorrow's threats. Before we add a new product to the platform, we determine if it can identify malware that the others cannot, or find them faster and more reliably. You don't need to configure any of the security tools yourself. We take our partners' latest software and wrap the core technology in the Avanan API, standardizing all their user, file, event, and policy information. This is more than just running code in the cloud—we make cloud-native versions that are not available anywhere else. You can deploy your choice of security tools or use one of the Avanan bundles. We monitor and update the combination of products that will provide the best security in each category. You don't need to pay for each security tool individually. We have consolidated each vendor's individual licensing model into a single per-user, per-month subscription. You only pay for what you need. Because everything is in the cloud, purchasing multiple layers of security can be the same price as just one in a datacenter appliance. One click in the interface spins up a new instance of the preconfigured security tool. Avanan manages the size and scale of the hardware you need, and handles all the licensing. It truly is one click. 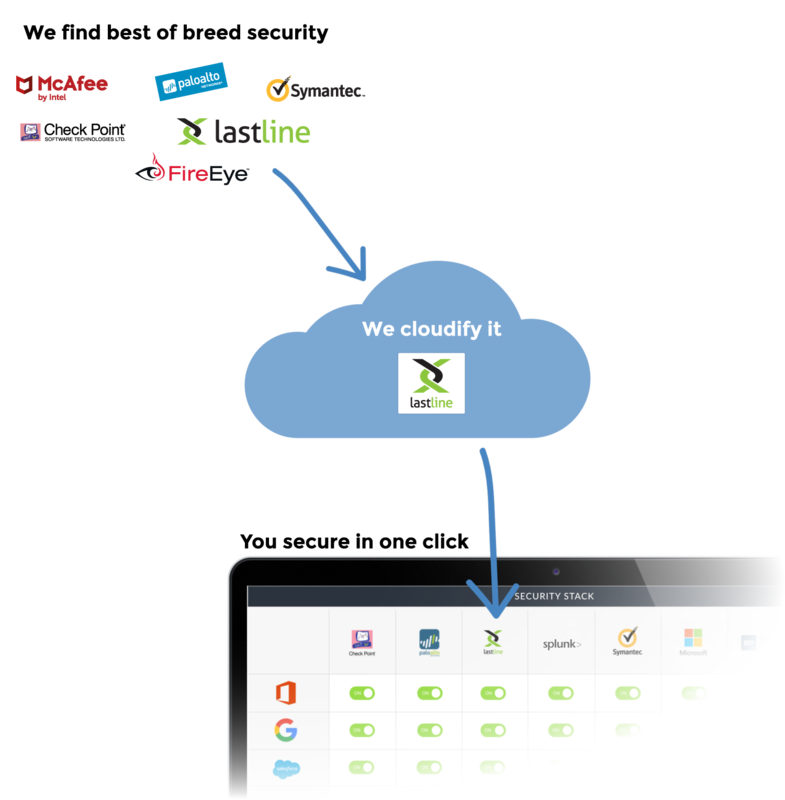 You can secure all your SaaS from within the cloud. 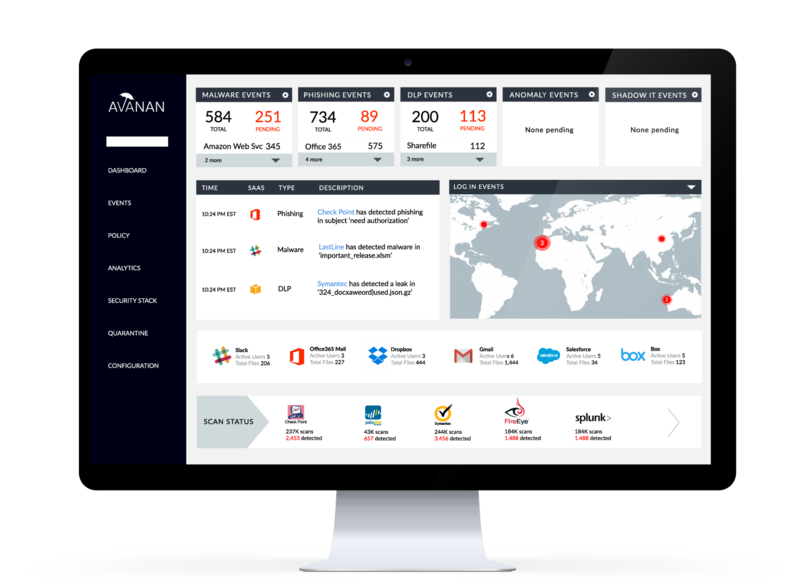 Avanan connects directly to the native API of every enterprise SaaS or IaaS application. This provides both real time and historical information about every user, file, event, and policy—not only of your users, but everyone who has access. You don't need to redirect your traffic. With our 100% visibility, we have no need to put a gateway or agent between your users and their apps: no latency, no disruption, no change in user experience. You don't need to configure security separately for each application. Because the context of an email, a file share, a database, and a collaboration tool differ so greatly, we map the user, file, and permission conditions of each cloud, making policy meaningful across different SaaS. It takes seconds to connect to a new SaaS. Avanan uses the latest OAuth token-based, TLS-encrypted protocols, and only asks for the minimum level of required access. Avanan never sees your password. You don't have to manage policies individually for each SaaS. Every SaaS has a completely different policy engine, each with its own rules and enforcement capabilities. We map these across all your SaaS, and even supplement them with more granular controls. This way, you can create one policy and apply it everywhere without having to do the translation. You don't need to actively manage your SaaS security. Context-aware policies make it possible to create enforcement workflows that inform the user of the issue, offer policy-safe options, and audit responses above and beyond what the built-in permissions controls in each SaaS ordinarily allow. You don't need to look in multiple locations to see all your reporting. We capture security events from both the SaaS and security tools and combine them in a meaningful way to send to your existing SIEM. By standardizing all of your security tools across all of your SaaS applications, we make it easy to view and manage every aspect of your security from a single dashboard. Approve the Avanan app from the app store of the SaaS you wish to secure. Once approved with an admin account, Avanan will start securing all your corporate users' accounts.